He who permits himself to tell a lie once, finds it much easier to do it the second time. Is America Ready: Mayor Pete – 2020!! About a month ago I saw this young guy get interviewed. The interviewer said the guy was the Mayor of some place in Indiana (okay, it was South Bend, but all I heard was blah, blah hicks-ville, Indiana). He is in his second term and got re-elected with over 80% of the vote! He is a graduate of Harvard and an Oxford Rhodes Scholar. He speaks seven languages and learned one of them just so he could read a book in the author’s native tongue. He is a former Naval intelligence officer and served in Afghanistan (for seven months) while on leave without pay from his mayoral duties. So, I listened to him speak… And, I decided. Prior to this, my three favorites for the Democratic nomination were (in order): Warren, Harris and Saunders. (Yes, I am a Progressive / Liberal Democrat!) To be honest, I think all have their weaknesses, but I believe any of them could defeat Trump. The rest of the field, I’m not so sure of (including Biden), I don’t know anything about or I don’t really care for. 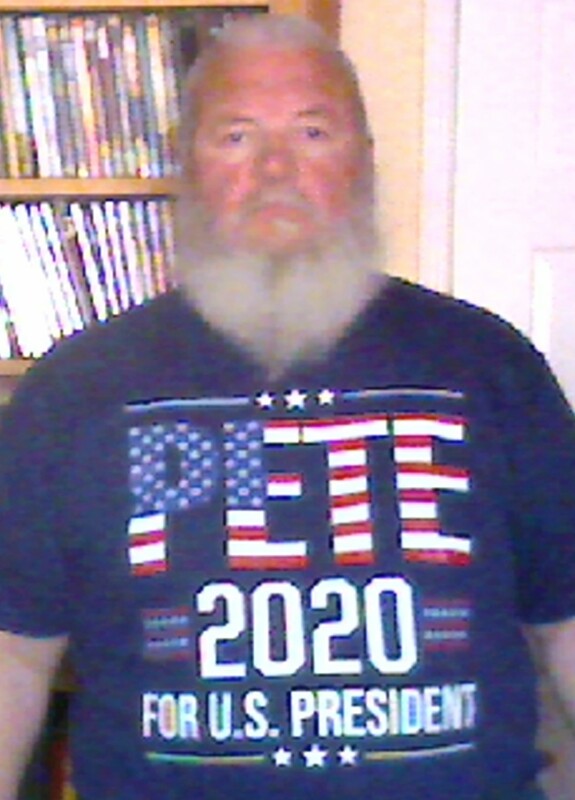 Anyway, I went online and bought a t-shirt – not realizing Mayor Pete hadn’t declared yet and was still in “just” the exploratory phase. My daughter came over that evening and we were discussing who we each were favoring. I said: “Mayor Pete, but I can’t pronounce his last name.” She said: “Do you really think he can get elected?” I replied: “Sure. Why not?” Her reply: “He’s opening gay…” WHAT??? She asked how I could support him knowing this and pointedly adding that putting up a candidate who could defeat Trump was the most important thing the Democrats could do and she didn’t think the country was ready to elect an openly gay man. I said I agreed, but I didn’t think the country was ready to elect an African-American in 2008 or re-elect him in 2012 and look how those elections turned out. Does being straight or gay matter when you are running for ANY political office? From an electability standpoint, of course it does. But should it? If I don’t believe faith (Kennedy), infidelity (Bill Clinton and probably a host of others), race (Obama) or gender (Hilary Clinton) matter, why should sexual orientation? Is being “straight” critical to Presidential job performance? When asked about whether gays should serve in the military, Republican Senator Barry Goldwater replied (I’m paraphrasing): “I don’t care if someone is straight. I just want to know if they can shoot straight.” We KNOW President Trump is not very bright (he doesn’t read and has no curiosity), is a liar, is a cowardly draft dodger, is a tax cheat, is a terrible businessman, he appears to be a Russian puppet and he seems to only be interested in making money off of his term in office. On balance, Mayor Pete is intelligent, well spoken, well read, a patriot and more than competent in his current office over the last two terms, so no, being openly gay does NOT matter to me. I hope American will listen to what “Mayor Pete” has to say… Then you can make up your mind and vote you heart. Is America ready for an openly gay President? To be honest, I don’t know… But, I AM!